So I was recently working on an infection map and getting feedback on it. It was the map that I submitted to the Forgetacular contest some time back. The initial feedback that I received was that there were some areas along the edge of the play area that a human could hide. At first I didn't think this might be the case, save in one or maybe two locations. But to my surprise, from Alaska, there are quite a number of such ledges just below the top of Alaska's ridge lines. The question was, how do I prevent humans from hiding on these spots (to become a survivor)? On a thread at Forgehub, a discussion was engaged on the topic of how to keep players from camping on a map. Do you cover the camping locations with Kill Boundaries, or is there a more eloquent approach, such as modifying (read that, "fix") the map? My position was that if a camping location was even remotely intuitively part of the playing area, then Kill Boundaries should never be used. Instead the map should be modified. The reasoning was that if an objective game were supported, a player could unwittingly carry the objective into the Kill Boundary. If it were a Soft Kill Boundary, then the player would see a 10 second warning, but the objective would immediately reset. This would produce confusion and frustration, because the player would not have known ahead of time that the Soft Kill Boundary was even there - it is invisible, after all. And if it were a Kill Boundary, then the consequences are even worse. I still think this rule is correct. If a location appears as part of the playing area, if there are no visual cues whatsoever that it is outside the play area, if the players have no reason to suspect any type of Kill Boundary exists over that area, then there should never be any Kill Boundary applied. This rule ensures that the map plays as it appears, eliminating confusion and ultimately frustration. In the case of my infection map, a player must walk down or jump down below the obvious playing area onto the ledge. This means that they are intentionally trying to evade visual detection by hiding in what is reasonably interpreted as off the play area. For this reason, a Kill Boundary would be an acceptable solution. The only question remaining is what kind of Kill Boundary? If when a player walks down a ledge or jumps down to the ledge, if they can quit the ledge back to the play area, then a Soft Kill Boundary is the correct solution. It allows them to traverse back to the play area before they die. But if the ledge is too low to make a jump back to the play area, then an instant death is better, to speed up the respawn process, so that they can get back into the game sooner. Each separate ledge was judged and tested based upon this single criteria, and the appropriate Kill Boundary was applied to it. The result was that the side surfaces of Alaska was studded with over 20 Kill Boundaries and Soft Kill Boundaries. Are there other solutions? 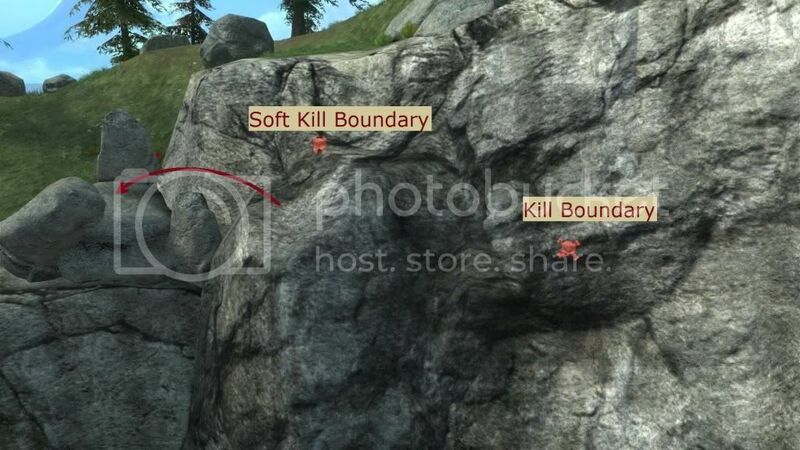 Going back to the question of whether it is abuse to use Kill Boundaries to prevent camping, though none of these locations could reasonably be considered by any player as part of the play area, making them incapable of being camped by modifying the ledges is a legitimate alternative to Kill Boundaries. What I mean by that is if a structure (say a rock) was used to create a slippery slope over the ledge, then the player could never land on the ledge and would simply fall to his death in the first place. This is a legitimate solution. No doubt about it. It takes the temptation away from the player in the first place. They will never get stuck on a ledge that has a 10 second count down. They won't jump to their death when they initially think that they are jumping to a camping spot. There are very good reasons to go this route. I may change the map again to use map modification rather than Kill Boundaries. But if I keep the Kill Boundaries in place, their presence are reasonable. None of the ledges could reasonably considered part of the playing field. So the use of the Kill Boundaries in this one is not Kill Boundary Abuse. I just think that map modification is a more eloquent solution, as it takes away any visual aspects that can temp a player to cheat by hiding off the playing area. And a map with visual cues to reinforce the players' engagement of the game is a happy map.